Germline CDH1 mutations, classically associated with hereditary diffuse gastric cancer (HDGC), also imply an increased lifetime risk of developing lobular breast cancer (LBC) in a highly penetrant autosomal dominant manner. 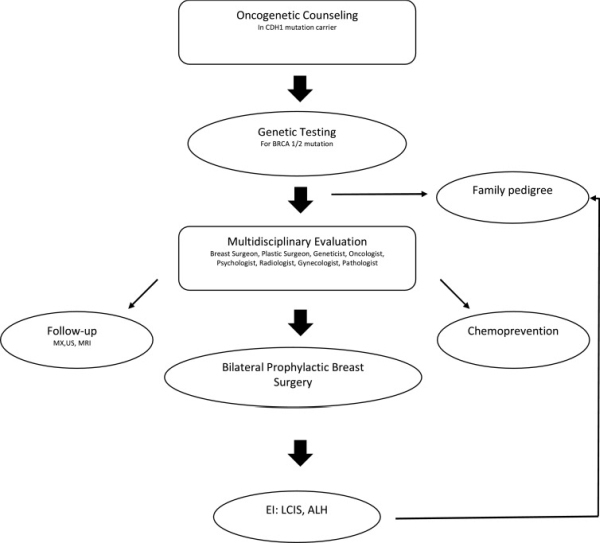 International Journal of Surgery Case Reports, report a 44-year-old woman CDH1 mutation carrier with a strong family history of cancer, who previously had prophylactic total gastrectomy. We registered normal findings at the breast and axilla assessment. Mammography, ultrasonography and breast MRI scans were negative for cancer. In our Institute a bilateral prophylactic mastectomy followed by breast reconstruction was performed. Foci of atypical lobular hyperplasia(ALH) and lobular carcinoma in situ (LCIS) were histologically shown.